Corn rests inside of a grain cart during a harvest on a farm near Dixon, Nebraska, U.S., October 26, 2017. Note: The opinions expressed here are those of the author, a market analyst for Reuters. The debate over spring plantings in the United States always heats up this time of year, but lately the topic is particularly hot. Corn, soybeans, spring wheat, cotton and other crops are all competing against one another for a spot in the acreage profile of American farmers and there are pretty good arguments supporting each of them. The U.S. Department of Agriculture will publish its prospective plantings at noon EDT (1600 GMT) on March 29. Historically, this report has produced some of the more volatile days on the Chicago Board of Trade. Earlier this year, USDA slated corn and soybean plantings to hit 90 million acres apiece, along with 46.5 million acres of total wheat. But some industry ideas have soybeans as high as 92 million acres, with corn landing around 88 million. The economics may indeed favor heavier soybean plantings than what USDA suggests, but the argument for corn might be stronger than it was a year ago. And other competitors such as spring wheat and cotton cannot be counted out, either. Although the run ended Monday, December corn futures spent nearly three weeks at or above $4 per bushel, reaching a high of $4.12 a bushel on March 14. Producers are generally more positive about profitability potential when new-crop corn crosses the $4 mark. Futures prices were not as strong a year ago. In the first three months of 2017, the December contract closed above $4 a bushel only twice and on nonconsecutive days. Export demand for U.S. corn has reached record levels since the beginning of the year, which should be a very encouraging factor for corn producers. 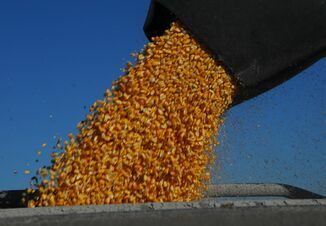 This, along with strong demand from ethanol, could significantly cut the swollen domestic inventory, potentially below 2 billion bushels by the end of the summer. Another standout item in the case for corn is the improvements to yield, which is key in driving a producer’s overall profit. In 2017, U.S. national yield hit an all-time high of 176.6 bushels per acre, surprising many growers who had been somewhat nervous about the crop’s potential after rains shut off in the Midwest during the second half of the season. 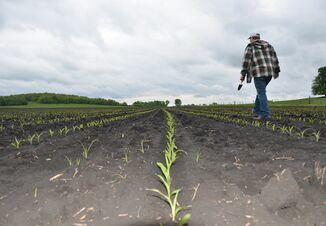 Since corn is typically planted prior to soybeans in the United States, sometimes whether to plant the yellow grain can be a game-time decision based on the weather between late April and early May. If the perfect planting window opens up, a farmer may opt to take advantage and put some corn in the ground. Corn plantings in the United States hit 90.2 million acres last year, down 4 percent from 2016. 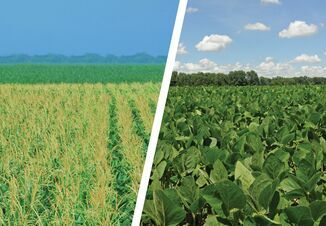 According to the futures market, soybeans still have the advantage over corn, and recent prices suggest that analysts may ultimately underestimate soybean acres next week. The price ratio of November soybeans to December corn is an important indicator of which crop U.S. farmers may prefer to plant in the spring, and values of 2.5 or greater tend to favor soybeans. On Wednesday the ratio was at 2.59, similar to last year and well above the long-term average. In the past, highly elevated new-crop soybean-to-corn ratios have coincided with lowball market estimates for soybean acres in USDA’s March plantings report. So far in March, new-crop November soybeans are averaging about 30 cents per bushel more than in the same period a year ago. But higher expected returns on the oilseed over corn in 2017 led U.S. farmers to plant a record 90.1 million acres, some 8 percent more than in the previous year. One potential drawback for soybeans could be rotations, as producers who heavily favored soybeans in 2017 may be hesitant to plant them again on the same fields. Beans after beans can make disease management more difficult and can cause the soil to erode more quickly. Soybean planting usually begins in earnest in May, and more than two-thirds of the crop should be sown by the end of that month. U.S. farmers planted just 11 million acres of spring wheat in 2017, the fewest since 1972. Durum wheat acres were 2.3 million, and USDA last month said that combined spring and durum area in 2018 would rise 4 percent from last year. After supply decreased and prices rose following last year’s drought in the Northern Plains, spring wheat became a more attractive option for 2018. The ongoing drought in the Southern Plains and its struggling hard red winter wheat crop could strengthen the case for spring wheat. If the hard red winter wheat harvest falls considerably short, the demand for high-protein wheat could be greater than usual this summer, which could be satisfied by the spring variety. Weather could derail this plan, though. Spring wheat farmers in the Northern Plains typically get started with planting between the last week of March and the first week of April, but winter has not given up yet. Snow cover in lead producer North Dakota is above average, a snowstorm is expected to begin on Friday, and average to below-average temperatures are expected to prevail through the first week of April. Snow cover can melt very quickly in the spring, but it will be discouraging for growers if winter is still hanging on well into April. USDA has penciled in 13.3 million cotton acres for 2018, up 5.5 percent from last year’s 12.61 million, and a lot of this increase would come out of corn. In its outlook last month, USDA cited that cotton futures in January through early February averaged about 4.5 percent above price expectations from early 2017, while prices for corn and soybeans declined slightly over that same time frame. Although front-month ICE cotton futures remain elevated relative to last year, the price situation for corn and soybeans changed in mid-February and both are at higher levels than in 2017, so USDA’s analysis is somewhat dated. Another factor USDA considers in its planting model is early June soil moisture conditions on the Texas High Plains, where a large portion of the country’s cotton is grown. That area has been extremely dry since late last year, which has prompted USDA to pre-emptively make some abandonment and yield assumptions, but the situation has worsened since the outlook was issued. If rains are still insufficient by the time No. 1 producer Texas ramps up its planting in May, cotton acres may fall short of USDA’s preliminary target. But recent legislation may favor cotton plantings, anyway. Cotton growers are now eligible for subsidies through USDA’s new Cotton Ginning Cost Share program, designed to lighten the economic burden and assist growers with marketing. Also effective this year, seed cotton will be covered under the agency’s Agriculture Risk Coverage/Price Loss Coverage programs. The increased price protection for cotton growers could ultimately steal some southern acres from corn and/or soybeans, which will also be battling it out with spring wheat in the north.